A wedding album is a connecting point for generations to come. As your daughter sits on your knee and asks, "Tell me again, how did you fall in love?" you'll show your love story through your album. Our album commissions start at $2,500. Our clients complete our wedding album questionnaire that shares with us their preferences. That means our initial design looks exactly like what they are expecting to see. It also means we listen to their needs, requests, and desires. No hard upsell. No rigid rules or regulations about making changes and revisions. We want it to be perfect for you. Watch out for anyone who tries to pressure you into buying something. On average, our couples and their families do spend more than the starting price, and here is why. Some families desiring multiple volumes or multiple copies that span larger or multi-day events. Multiple volumes allow for more sides than one volume can physically contain. The pricing for new sides (pages) used in an additional volume(s) is the same as any other side. There are no special charges for the extra design work, retouching, cover materials, etc. Our wedding album overview article explains in further depth your the variety of options and process. Once you album is approved you can use our cover swatch gallery and cover overview to guide your personalization options. Notice that we do not change the price based off of the physical size of the album you order, i.e., Small, Medium, Large, etc. All of our album commissions include your personal choice of both Size and Shape, and Cover styles. Some prefer a massive album displaying and supporting the weight on a table. Others enjoy the intimacy afforded by a smaller album size easily enjoyed by two people sitting next to each other. 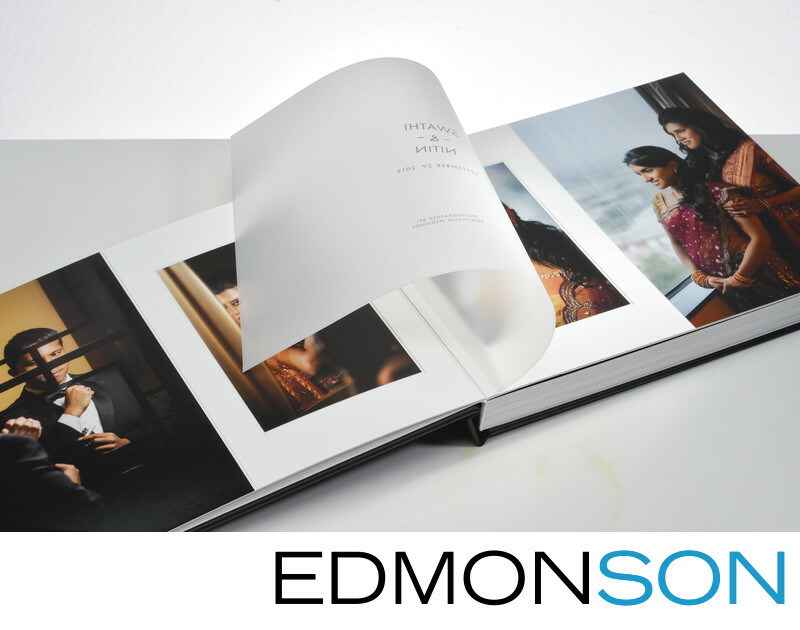 Since the time and energy spent producing a wedding album isn't different based off of the ultimately printed size we customize each one for you. To recap, we provide you with a simple online album questionnaire, sharing with us your preferences and providing everyone an easy reference. We offer album consultations to assist you by seeing, touching and getting any questions answered. We have found that while our clientele may indeed have discretionary income, what they don’t like are surprises. We base our business philosophy on the belief that we should always present you an design based exactly on what's in your questionnaire.